Everyone has noticed the difference between a pair of gloves and a pair of socks. A sock, like its partner, can be worn on either the left or the right foot. But a left-hand glove, unlike its partner, cannot be worn on the right hand. Like a pair of gloves, some molecules possess this property which affects their chemical behavior. 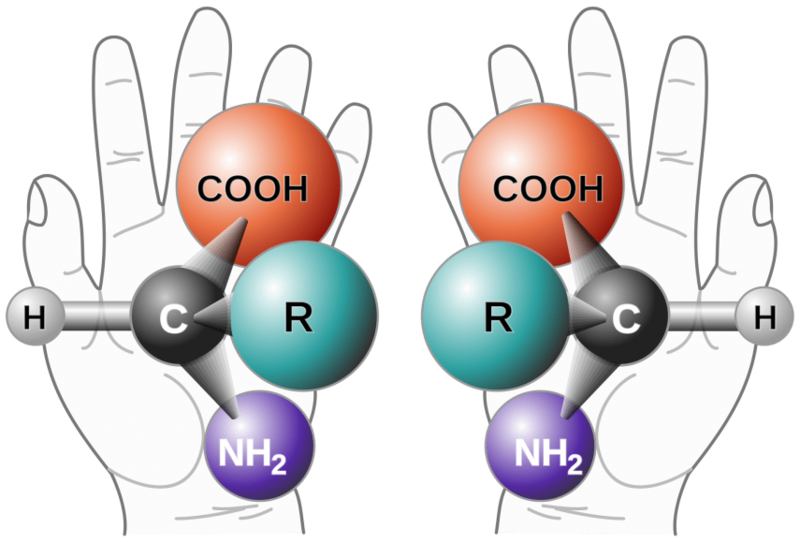 The word “chiral” comes from Greek, meaning hand. A molecule (or object) is either chiral or achiral. The mirror image of a chiral molecule cannot be superimposed on the molecule itself. The mirror image of an achiral molecule, however, is superimposable on the molecule’s self. The pair of molecules that have non-superimposable mirror images are called enantiomers. Enantiomers of chiral molecules can elicit quite different biological responses when taken by living organisms. The tastes, odors, medicinal properties, toxicity, bactericidal, fungicidal, insecticidal, and other properties of enantiomers often differ widely. For example, (S)-naproxen is an important anti-inflammatory drug, while its enantiomer is a liver toxin or (R)-thalidomide is a sedative and hypnotic, while its enantiomer is a potent teratogen. The importance of chirality is well recognized, mainly in connection with the fact that nearly all natural products are chiral and their physiological or pharmacological properties depend upon their recognition by chiral receptors, which will interact only with molecules of the proper absolute configuration. Thus, the use of chiral drugs in enantiopure form is now vital and the development of new synthetic methods to obtain enantiopure compounds has become a key goal for pharmaceutical companies. Secondary alcohols are an important part of these chiral molecules that serve as useful intermediates for the synthesis of biologically-active compounds, such as medicines and agrochemicals. A convenient method to obtain the chiral secondary alcohols is the enantioselective reduction of prochiral ketones, which can be achieved by using enantiomerically pure metal catalysts. Asymmetric hydrogenation (AH) (hydrogenation with molecular hydrogen) and asymmetric transfer hydrogenation (ATH) (uses the organic molecules as hydrogen sources) are the most preferred methods for this purpose. The importance of the latter has been increased in the last three decades and has several advantages compared to the use of molecular hydrogen, such as; (a) simple equipment; (b) safe manipulation; (c) environmentally friendly solvents; and (d) the ability to be applied to industrial processes. It is clearly known that the performance of metal catalysts is directly related to the organic molecules (ligands) that surround the metal center. The very different catalytic results can be obtained with the same metal by changing the ligands that surround the active metal center. Furthermore, the small modifications on similar ligands can be caused by the significant catalytic results, as well. In this context, several ligands have been designed and tested on ATH reactions. Among them, the ligands that can serve electron pairs to the metals by phosphorus and nitrogen atoms (PN type ligands) or oxygen and nitrogen atoms (PO type ligands) are the most effective types. Interestingly, the application of the PNO type ligands, however, in the ATH reactions is very rare. Despite the numerous study revealed the importance of NH proton in the catalytic cycle of outer-sphere mechanism, none of the reported PNO type ligands contained NH or OH moieties. Recently, new PNO type chiral ligands that have phosphorus atoms with a different electron donating ability and with different steric hindrance have been synthesized by the researchers at Mersin University. These ligands were used to investigate the influence of electronic and steric features of phosphorus donor of PNO type ligands on the ruthenium catalyzed ATH reactions of ketones. Researchers also investigated the effect of PPh3 and CO as auxiliary ligands on the catalytic activity of PNO-ruthenium complexes. The very interesting results have been obtained including the unexpected substrate and configuration selectivities. Researchers have performed some quantum chemical calculations to understand the chemistry behind the different catalytic activities of the complexes. It was found that the auxiliary ligands caused enormous differentiation on both on the ligand’s active protons (NH and OH) and metal hydride charges and also on the highest occupied molecular orbital (HOMO) surface diagrams of the metal complexes. The unexpected catalytic performances of the complexes were rationalized based on the acidity of OH protons and on the HOMO surface diagrams of the PNO-ruthenium complexes. The approach that used in the research may facilitate the design of new catalysts which are cheaper and environmentally-friendly. These findings are described in the article entitled New phosphine-amino-alcohol tridentate ligands for ruthenium catalyzed asymmetric transfer hydrogenation of ketones, recently published in the Journal of Organometallic Chemistry. This work was conducted by Orhan Altan and Mustafa Kemal Yılmaz from Mersin University. Orhan is a research scientist at Mersin University. Previous Post« Previous Social Security: Do Specific Social Relationships Make Animals Safer?